Given the modern twist of fashion and iconic statements, both the young and old these days are ditching their contact lenses and adorning glasses instead. But how is it that everyone is affording new frames within months of their old ones? For the chase of trendsetting looks while keeping our budget in check, we look to new areas for ideas. 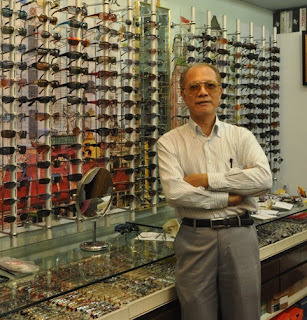 Today's lifehack presents a little secret tucked in the basement of Peninsular Shopping Centre - New China Optician (#B1-12) run by Uncle Tony. Understanding this new slang of eyewear, the purpose of Uncle Tony's shop is to create value-for-money products that are in demand. This family-run business was started almost 9 decades ago by his father, and Uncle Tony flies their flag loud today, priding themselves on affordability and variety. The shop may seem unimpressive from the outside, but scores of young folk come looking for Uncle Tony's collection of vintage, avant-garde frames. At Lifehacksg, we came, saw the price and had to have our eyes checked! A normal pair of glasses will only cost you a total of $40, instead of the hundreds you are inclined to pay for a branded pair thinking it will earn you some street cred. Well, sure. For about 3 months, that is. Even some neighbourhood opticians that are deceivingly friendly are actually making huge margins on their glasses. For an affordable rate, you get to scour through Uncle Tony's plethora of injection-mold plastic frames for just $10. With these frames, request for an eye screening and a basic set of lenses. These will cost you $30 for a pair. Of course, if you wish to go for the high end/vintage frames, you will have to fork out more money. Like any other prudent Singaporean (or not!) consumer, Lifehacksg asked the question of quality. To our surprise, we found the product highly durable within our standards and were very satisfied customers. Though not guaranteeing that it will last you forever, we daresay that it is worth every penny spent and we give our seal of approval! Another pet peeve that some of you might have with opticians and making new glasses is the long waiting time that sometimes spans days or weeks. At New China Optician, the average waiting time is 45 minues - 1 hour. He plies his trade diligently, making the lenses on the spot and will be ready soon after you take a walk around the block. That is how closely Uncle Tony sticks by his principles - no fuss, no frills, just essentials. Being a friendly and sprightly man, Uncle Tony might even just let you in on his life story over a cuppa in his tiny shop. The next time you wanted something more than just an optician visit, check out this recommendation by Lifehacksg. Sweet. Shall check it out, my current specs is 2 years old already. Definitely! Hope you encounter some great finds! As today, the cheapest would be $55 for hard frame, $65 for more flexible China/Korean frame (black color only).